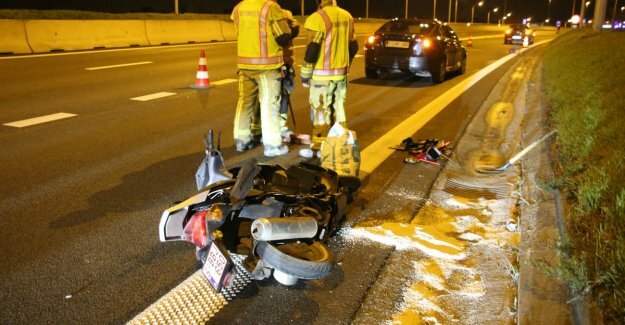 Kortrijk bromfietster's Sunday night injured in a traffic accident on the R8 at the height of the exit Kortrijk Noord. The bromfietster was the R8 in the wrong direction in turn drove up and was hit by an Audi. “I drove in the direction of Kuurne when suddenly a motorcycle for me came along,” says the driver of the Audi. “That must be The R8 in the wrong direction are in turn drove up and went to the spookrijden. I have the moped still try to dodge, but was blinded by the lights of the moped.” Finally got the Audi, the moped with his side. The driver of the moped crashed, and was injured to the hospital. “She was conscious and said that they Bavikhove had, this is still not the job in the direction Bavikhove. I am very shocked, this could be a lot worse is over.” By the accident was the exit Kortrijk Noord for a while, closed to traffic.